THE CHARLETON TRIBUNAL has completed hearings in relation to whistleblower Garda Keith Harrison and invited submissions from lawyers on the evidence it has heard in the current module. Chairman Mr Justice Peter Charleton outlined the issues he expects barristers to address in their submissions, based on the evidence he had heard. For the last month the tribunal has examined evidence of contacts between gardaí and the HSE/Tusla relating to Garda Harrison. Earlier, Sergeant Paul Wallace told the tribunal he was asked to conduct a security assessment around Garda Harrison’s home following threats made against the garda in early October 2013. When he called to see Garda Harrison on Monday 7 October 2013, the garda was “quite agitated and nervous”. 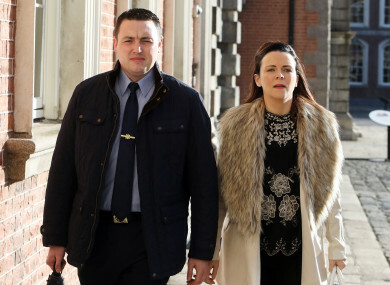 Garda Harrison told Wallace that his partner Marisa Simms had told him she had been in Letterkenny court seeking a safety order against him, and had made a statement to gardaí about him. Wallace said that Garda Harrison said Simms told him that while she was making her statement, Chief Superintendent Terry McGinn had spoken to her and said “that no guard will treat a woman like that, I will see to that”. Wallace said he told Garda Harrison that he did not think this sounded like something McGinn would do. The sergeant said that Garda Harrison felt the reason for Simms’ complaint was a misunderstanding over a comment he made to her in the course of a verbal disagreement when he stated, “You will get burnt there”, using it as a figure of speech which Simms took up the wrong way. Wallace said he did not assess the seriousness or credibility of the threats against Garda Harrison and his job was to “look at the physical infrastructure” and advise on security measures. Detective Inspector Patrick O’Donnell told the tribunal that he was told of a threat against Garda Harrison on the evening of 4 October. He later attended a garda conference on 8 October, where he outlined the information gardaí had received. O’Donnell said he had no expertise in relation to Gsoc or the HSE, and did not recall discussions about them at the garda conference. Superintendent Mary Murray told the tribunal she was appointed by McGinn to conduct disciplinary and criminal inquiries into Garda Harrison on 10 February 2014. The superintendent said that while she was still preparing for this inquiry, she learned from media reports in May 2014 that Garda Harrison had made a protected disclosure to the Garda confidential recipient. The witness said she had not been able to contact Garda Harrison as he had been absent from work on leave for much of the period between February and May 2014. Murray said she did not feel it appropriate to continue her investigations while this process was ongoing. Murray told the tribunal that she regarded the alleged threats by Garda Harrison as serious, but had since heard the explanation of Garda Harrison that they were based on a misunderstanding. A senior Gsoc investigator said the referral of the complaint was “strange” and did not meet the required definition of serious harm. Johan Groenewald, an investigator with the ombudsman, told the Charleton Tribunal that the referral of the complaint against Garda Keith Harrison was made under Section 102 of the Garda Siochána Act, relating to gardaí causing serious harm or death. Groenewald met with Garda Harrison in July 2015, when the garda whistleblower outlined several complaints to him. In a statement, Garda Harrison said that Groenewald expressed concerns about how a statement by Simms was “forced on Gsoc” by Chief Superintendent Terry McGinn. Garda Harrison said Groenewald told him the referral, and the manner in which the statement was obtained in the first place, was “extremely unusual”. Groenewald said he had no recollection of saying it was unusual. But he said the referral was “strange”, as the alleged threats outlined in the statement did not meet the definition of serious harm required in the Garda Siochána Act. He said he would have expected a referral to be made under Section 85 of the Act, which covered less serious complaints. Groenewald also said he would be surprised if there had been no garda investigation into Simms’ statement. Another witness, Superintendent Michael Finan, told the tribunal that on 8 October 2013, he was called to attend a garda conference concerning Garda Harrison. He was told the conference was in relation to “a statement (that) had been made by Marisa Simms in relation to alleged conduct by Garda Harrison and also in relation to threats made against Garda Harrison”. Attending the meeting – mentioned earlier – were McGinn, Superintendent Eugene McGovern, Detective Inspector Patrick O’Donnell and Inspector Goretti Sheridan. Superintendent Finan said he did not recall the exact detail of the conference, but the discussion centred around whether a referral to GSOC should take place under Section 85 or Section 102 of the Garda Siochána Act. “The main conversation regarding it took place between Chief Superintendent McGinn and Superintendent McGovern,” Superintendent Finan said. Earlier, the tribunal heard that McGinn and McGovern considered psychological harm as a result of a threat, or potential future harm if a threat were carried out, could meet the definition of “serious harm” required to make a Section 102 referral to Gsoc. Superintendent Finan also said he had no involvement in referring Simms’ statement to the HSE. Garda Carl Campbell, who attended the meeting on 8 October 2013, told the tribunal that given the nature of the threats reported and the seriousness of the allegation, he felt a referral to Gsoc under Section 102 of the Garda Siochána Act was appropriate. The garda said he did not recall any discussion about a referral to Tusla at the meeting. GSOC investigator Darren Wright said that when he was contacted by Superintendent Eugene McGovern on 8 October 2013 about Garda Harrison, he made it clear to the superintendent that if there was any risk as a result of a threat to Simms or Garda Harrison, it was a matter for An Garda Siochána to deal with, not Gsoc. “I was satisfied then and I am satisfied now that psychological harm would not be covered under the meaning of the Act,” Wright said. Wright said he had been with Gsoc since it opened its doors in 2007, and had never before seen a Section 102 referral for “psychological harm”. He said that he had never had a referral for a threat of future harm, which was why he had emphasised to Superintendent McGovern, and noted in his own records, that the protection of life and property was not a matter for Gsoc, but for gardaí. Wright said that there should have been a referral under Section 85 of the Act, as the statement from Simms contained a complaint against a garda and the issues were serious. Email “The Charleton Tribunal has finished its hearings about Garda Keith Harrison”. Feedback on “The Charleton Tribunal has finished its hearings about Garda Keith Harrison”.